From savory doughnuts to breakfast pizzas, this spice blend is overdue to go beyond the bagel. By Jacqueline Cain·	 8/17/2017, 3:30 p.m. The day I purchased the first-ever, everything-spiced, bacon, egg, and cheese doughnut sandwich that the flagship Union Square Donuts sold, I, of course, posted about it on Instagram. “Someone needs to do a side by side of this and the EPIC @blackbirddoughnuts everything [doughnut],” commented Cushman Concepts’ communications director, and my friend, Alyssa DiPasquale. And by “someone,” she meant us. 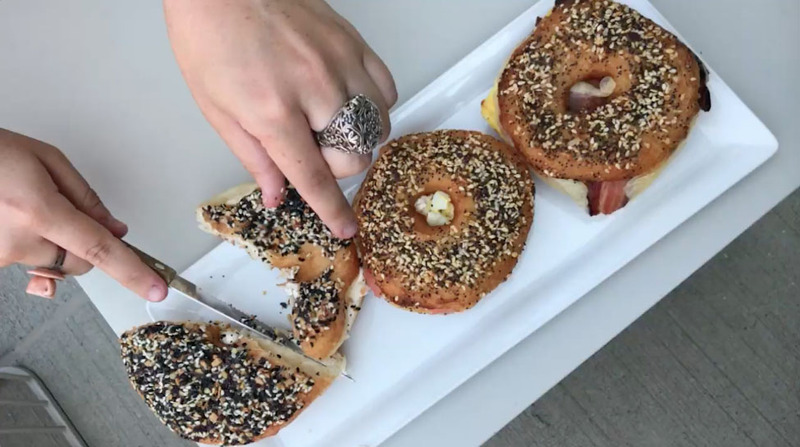 Last week, we got together on the Hojoko pool deck and shared the unique, cream cheese-filled Blackbird doughnut, alongside one each of Union Square’s new everything-spiced bacon, egg, and cheese doughnut sandwich, and a lox-filled version. DiPasquale calls herself an everything bagel fanatic. 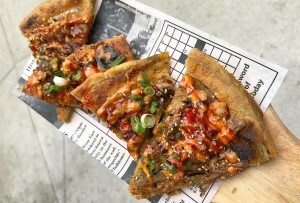 “It’s a savory thing, and it’s a texture thing,” she says, between bites of poppy-seeded, sesame-y, garlicky doughnut. It’s also a nostalgic thing. DiPasquale lives in Brookline, but she travels to New York frequently, as Cushman Concepts has a second O Ya location and two other restaurants there. She’s been known to haul a cooler with her, and fill it with everything bagels, caviar cream cheese, and house-cured lox from Russ & Daughters. “Now in the age of Mamaleh’s, there’s no need to do the cooler exchange. 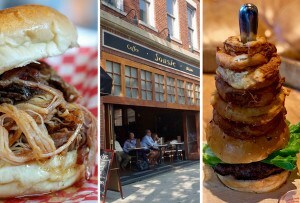 I get my fix in both places,” she says. But oh, how we would love to see even more items everything-spiced, beyond the brunch menu, at every kind of restaurant and bakery. And bar. A cocktail rimmed with black and white sesame seeds, poppy seeds, sea salt flakes, and dried garlic has potential, doesn’t it? My brunch with DiPasquale was everything I wanted, and it got me thinking about where else I could find everything, well, everything. 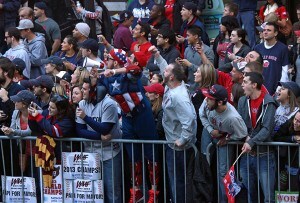 Check out my list below, and let me know in the comments where else you’ve enjoyed anything everything around Boston. Everything flavor permeates every Boston-area bagel shop, from Cambridge’s Bagelsaurus, to Levend at the Boston Public Market (which also makes a “flavor bomb” herbed everything), to Moody’s Deli in Waltham. But Exodus Bagels offers not only everything, crowned with the seasoning blend, but also everywhere, with the whole ring covered in spices. The pop-up also makes a bacon+everything-spiced cream cheese, and someday—maybe when it opens a diner in Roslindale?—owner Adam Hirsh hopes to sell his Beviled Eggs, a.k.a. bacon-everything deviled eggs. Available at various times, various locations, coming to McGraw Street, Roslindale, in 2017, exodusbagels.com. 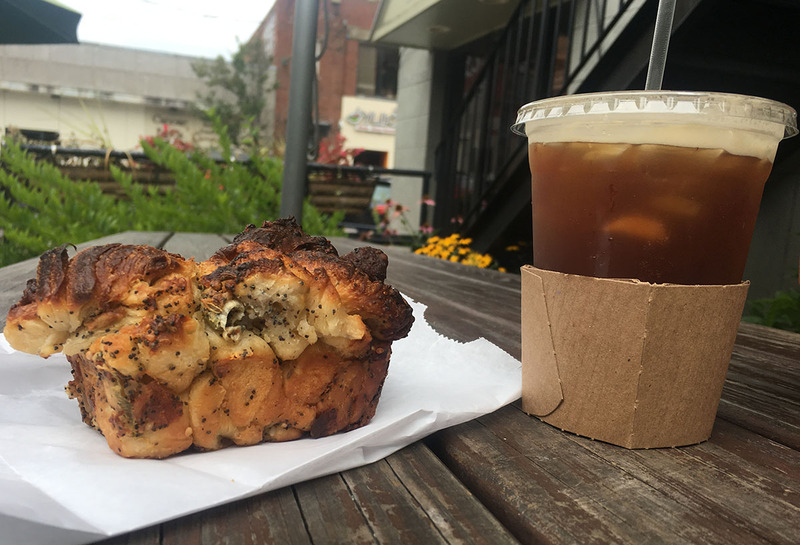 The Somerville bakeshop and its sister cafés Diesel and Bloc all carry “everything bagel” monkey bread. The soft, personal-sized, pull-apart loaf is studded with onions, fennel, poppy seeds, and more. Pro tip: Ask for it warmed up, with a side of cream cheese. Available daily, Forge Baking Co., 626 Somerville Ave., Somerville, 617-764-5365, Bloc, 11 Bow St., Union Square, Somerville, 617-623-0000, blocsomerville.com, Diesel, 257 Elm St., Davis Square, Somerville, 617-629-8717, diesel-cafe.com. 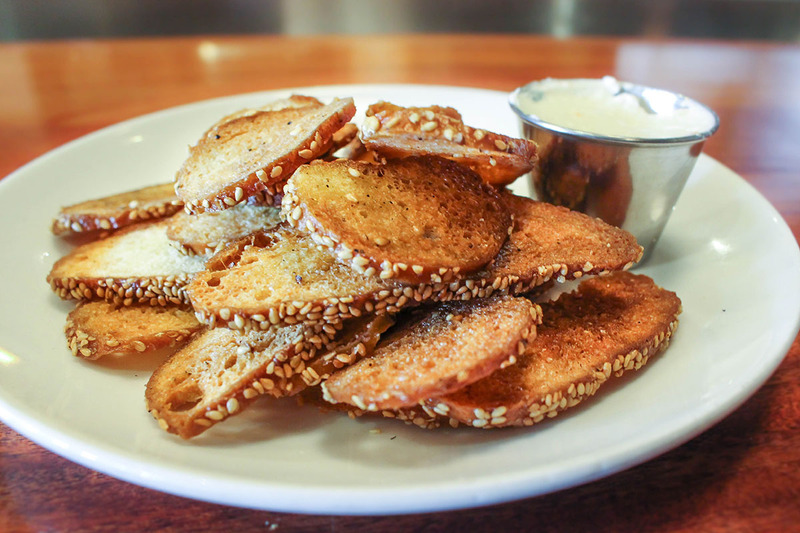 Chef Nick Dixon makes everything bagel chips in-house at this Southie spot, using Iggy’s everything bagels. During weekday brunch, they’re served with whipped habanero cream cheese. There’s also a smoked salmon pizza, which has red onions, capers, and baked eggs on an everything-dusted crust. Available Monday-Thursday, 10 a.m.-2 p.m., 425 W. Broadway, South Boston, 617-765-8636, lincolnsouthboston.com. 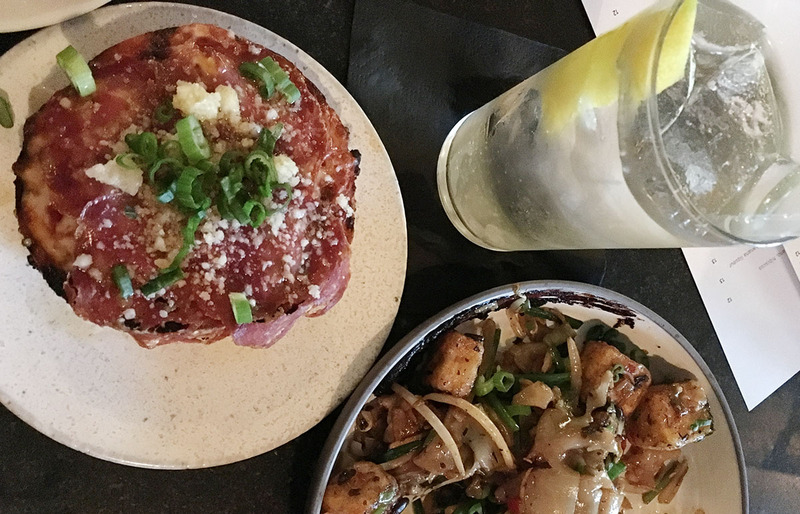 Better Bagels’ everything version is the base of Little Donkey’s zesty pizza bagel, topped with Nostrano ham, queso Chihuahua, and a spicy pomodoro sauce. 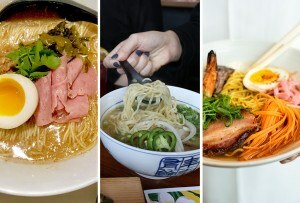 Available nightly during dinner, 505 Massachusetts Ave., Central Square, Cambridge, 617-945-1008, littledonkeybos.com. Every brunch menu needs a breakfast sandwich, but chef Jeremy Sewall’s team keeps it interesting with this sausage, egg, and cheese version on an everything pretzel roll. Available Sundays, 10:30 a.m.-4:30 p.m., 383 Congress St., Fort Point, Boston, 617-553-5900, row34.com. Chef Matthew Jennings makes everything cream cheese and slathers a house-made bagel with it, then adds gravlax, a fried green tomato, and a dill pickle during monthly brunch. 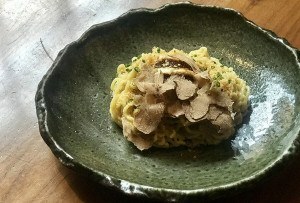 Available the last Saturday of every month, 11 a.m.-2 p.m., 120 Kingston St., Boston, 617-993-0750, townsmanboston.com. 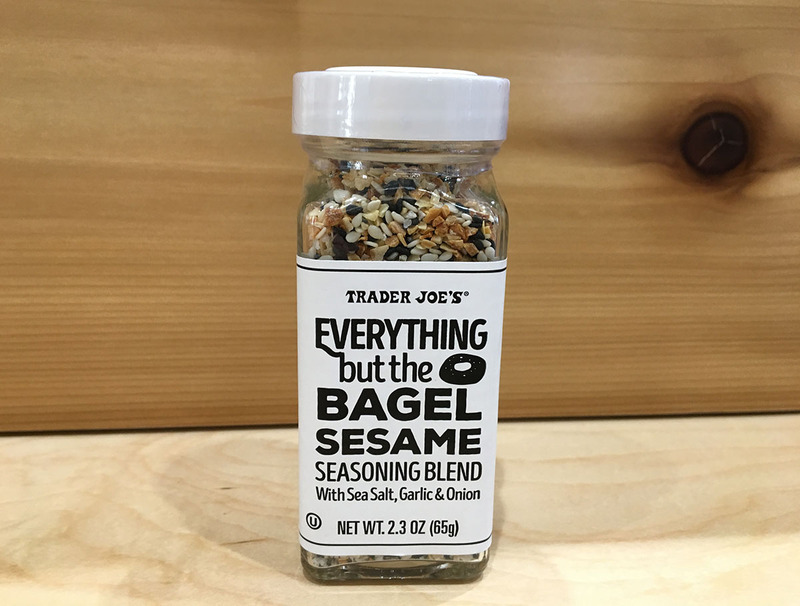 This grocery chain steps up in a big way with Everything but the Bagel Seasoning Blend ($1.99). The shaker is available nationwide, including at forthcoming Assembly Square and Lower Allston locations. TJ’s also makes an everything variety of its bite-sized seed crackers ($2.49). Trader Joe’s, coming to 133 Middlesex Ave., Assembly Square, Somerville, and 219 Western Ave., Allston; 899 Boylston St., Boston, 617-262-6505, 1317 Beacon St., Brookline, 617-278-9997, 748 Memorial Dr., Cambridge, 617-491-8582, and other locations, traderjoes.com. 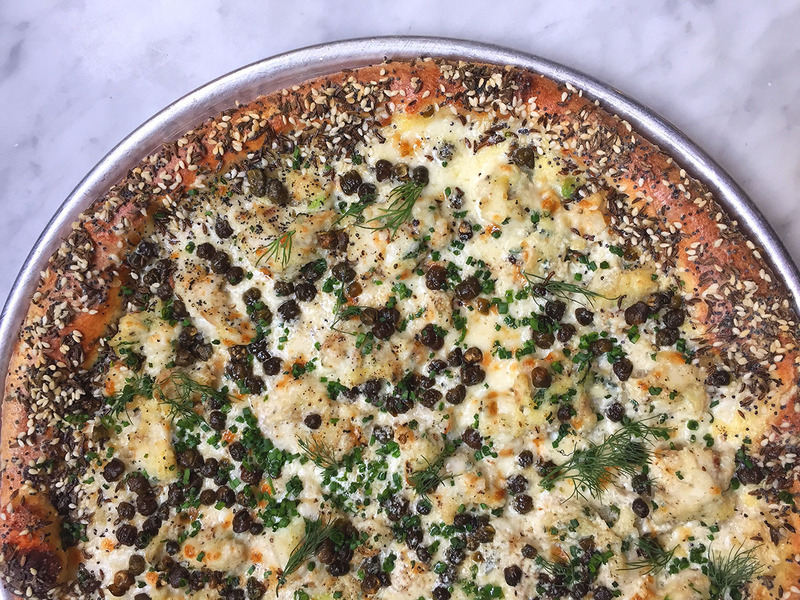 Michael Scelfo’s smoked whitefish pizza has mascarpone, dill, crisped capers, and an everything crust. 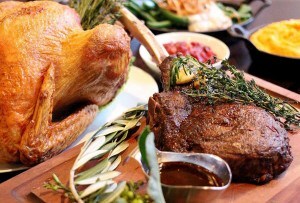 The ultimate hangover cure is on both the weekly brunch and nightly dinner menus. Available daily, 1030 Massachusetts Ave., Cambridge, 617-864-2300, waypointharvard.com. Everything doughnuts available daily until sellout at Blackbird Doughnuts, 492 Tremont St., South End, 617-482-9000, 20 Kilmarnock St., Fenway, Boston, ​857-263-8389, blackbirddoughnuts.com. Everything-topped doughnut breakfast sandwiches available daily until sellout at Union Square Donuts, 20 Bow St., Union Square, Somerville, 409 Harvard St., Brookline, 617-209-2257, unionsquaredonuts.com.